Raise your hand if you have ever owned a CB (Citizens Band) radio. Waaaaay back before everyone carried a cellphone (pre-late-1990s), the most common form of unlicensed communication was CB radio. Actually, up through the mid 1970s you were supposed to purchase a license from the FCC, although no test was required as for amateur radio. My first CB was a 23 channel job that I installed in my 1969 Chevy Camaro SS, during my senior year in Southern Senior High School. It was right in the middle of big CB radio craze with CW McCall's "Convoy" song topping the U.S. Billboard charts. My self-appointed 'handle' was "RC Flyer." Most people had no idea what it referred to (radio-controlled model airplanes). Now that all cellphones use internal antennas, almost nobody even thinks of them as being radios. CB radios reminded you of their true nature by requiring that a 1/4-wave vertical antenna (typically with a loading coil to keep it shorter than its 27 MHz operational frequency would otherwise require) be mounted to the vehicle roof or fender. Some low quality CBs wreaked havoc with model airplane radio control systems that operated in the lower region of the 27 MHz band. CB radios are still popular amongst truckers and local delivery services. Some really nice units can be bought nowadays with all the modern whiz-bang features like digital display and tuning, memory, built-in diagnostics, weather channel reception, and more. But, I digress. This article provides an introduction to radio wave propagation and how it affects CB radio operation. Discussion of ground and sky-wave signals for normal and unusual conditions, and distances to be expected. Even thousands of miles can be covered by means of a low-powered CB transmitter because of sky-wave "skip"
During the early days of CB, I was having a short conversation one Sunday morning using my mobile. There were skip signals coming in from the West and South. Some locals were even trying to work the distant stations. Being a law-abiding, FCC-fearing citizen, I ignored the skip signals as best I could. When another 19W called me, I answered immediately. "How far are you from Akron?" he inquired. "Oh, about 175 miles. Why?" "Well, that's too far" the voice on the other end said. "I thought maybe you could telephone my Dad and tell him where I am, but that would cost too much." I began to get a little suspicious. "Where are you?" I inquired cautiously. "Oh, driving along about sixty-miles-an-hour on a beautiful highway in the Arizona Desert!" I gulped when I heard that and ended the conversation as quickly as I could without being rude. Here I'd been talking to a mobile almost 2000 miles away, just as though he'd been down the street. His signal was loud and clear, never wavering, and ten-over-nine for the duration of the conversation. Here was one example of "skip," the kind of signal which legally I should not have answered. But, it is something which plagues the class D Citizens Band, especially during the winter months. It's often the subject of lively arguments, some of them quite inaccurate. But the subject is one that CB users should understand so they know what to expect at certain seasons of the year and from one year to the next. Most explanations of radio-wave propagation are concerned with determining the best operating frequencies for point-to-point communications. We on the class D Citizens band are confined to one band of frequencies. Our interest in skip signals is based upon either the interference they cause or, out of curiosity, their reason for being. Some of us are inclined to believe that the reception of signals from such distant locations is due to superior receivers or exceptionally good antennas, or even the locations of our stations. In fact, the reception of skip signals has little to do with the quality of our equipment. We're all subject to receiving skip on either base or mobile stations. Let's examine the mechanism of 27-mc. radio-wave propagation and see why this band has its own peculiar characteristics. Communication from one CB station to another is based on one of two basic types of propagation. One is called the ground wave. This is basically the wave we use in our daily communications and the type referred to in the FCC regulations. The other is referred to as the sky wave and is the one that accounts for the reception of skip signals. Fig. 1 - That portion of the ground wave that travels in contact with the surface of the earth is called the surface wave. Although we think of the ground wave as being one particular type of wave always propagated in the same manner. it is actually composed of four kinds of waves. These are known as the direct wave, the ground-reflected wave, the surface wave, and the tropospheric wave. These waves are shown in Figs. 1 and 2. From the figures it is evident how each type of wave travels. The direct wave is limited only by line-of-sight, or distance to the horizon, plus a small distance caused by diffraction of the wave around the curvature of the earth. The actual total distance can be approximated quite closely by assuming that the earth's radius is actually 4/3 of its true value. This will take into consideration the diffraction of the atmosphere. In other words, the radio line-of-sight distance, is actually slightly greater than a visual one. The direct wave could be very important in class D CB if we could erect antennas as high as we would like, but since we are limited by the 20-foot regulation, the direct wave can provide only limited distance communications. Assuming both receiving and transmitting antennas are about 20 feet off the ground, radio line-of-sight distance over even terrain is 9 to 10 miles. If, for base-to-mobile operation, we assume a 30-foot house with a 20-foot antenna or a total of 50 feet above ground for one end and 10 feet above ground for the mobile, we have a line-of-sight distance of about 11 miles. 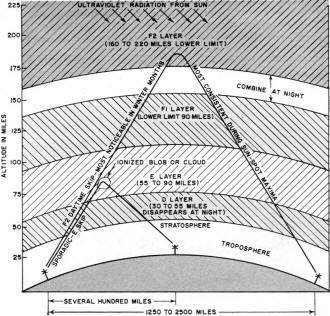 Or suppose we are talking base-to-base, with one station's antenna on a house, 50 feet above ground, and the other on top of a tall office building, 500 feet above ground, then the line-of-sight distance is about 40 miles. Conversations from an airplane at 5000 feet with a base station at 50 feet would cover a line-of-sight distance of about 110 miles. The ground-reflected wave is relatively unimportant in CB work because the reflected wave tends to be subject to phase reversal which results in a cancellation effect between the ground-reflected wave and the direct wave. This is especially true when the antennas are located relatively close to the ground, as is the case with the class D Citizens Band. The most important part of the ground wave for our work is the surface-wave component. The surface wave is not necessarily confined totally to the surface of the earth but may extend to some height, diminishing sharply in intensity with height. Part of the energy of a surface wave is absorbed by the ground and the rate of attenuation or the distance we can communicate is dependent upon the character of the surface over which communication takes place. If we rate the various types of ground over which communication is to take place, we find relative conductivity as shown in Table 1. Over very good surfaces, distances up to 40 or 50 miles can be worked with our 5-watt transmitters, noise being one of the limiting factors. When man-made noise is low, as is the case late at night, working distances can be expected to be greater. Since the surface wave actually extends for some height into the atmosphere, the condition of the air can affect characteristics of reception. On rainy, foggy days we may notice increased signal strength, due to greater conductivity experienced by the surface-wave component. The types of antennas we use, with relatively low angles of radiation, are also important for good surface-wave propagation because they concentrate more of their energy into a low angle of radiation. The tropospheric wave has little application in the 27-mc. CB band, but occasionally it accounts for reception of signals at somewhat longer than normal distances. It is caused by relatively rapid changes in atmospheric moisture, density, or temperature with respect to height. This results in refraction of the transmitted signal. One of the most common causes of the tropospheric wave is temperature inversion. This can result from a warm air mass overrunning a colder mass, the sinking of an air mass heated by compression, rapid cooling of surface air after sunset, or the heating of air above a cloud layer by reflection of the sun's rays from the upper surface of the clouds. Since tropospheric propagation is so dependent upon weather conditions, it is an unreliable means of 27-mc. CB communications, but can account for some of the effects which we have all noted. The greatest effects are at higher frequencies - 50 mc. and up. Fig. 2 - Other important components of the ground-wave signal that are responsible for Citizens Band communications. The sky wave is the culprit in all long-distance 27-mc. reception. It is not by any means confined to the 27-mc, Citizens Band and is used advantageously in other services where long-distance communications are permitted. On the amateur bands it is responsible for pea-power transmitters reaching remote corners of the world and this is one of the exciting and rewarding phases of amateur radio. The proud possessor of a DX Century Club Award for having worked 100 countries can thank the sky wave, and his own hard work, for this distinguished and cherished memento. The sky wave is that portion of a radio wave which is reflected from the layers above the earth's surface. As shown in Fig. 3, the atmosphere above the earth is more than one homogeneous layer of air. It consists of a number of different layers termed the troposphere, the stratosphere, and the ionosphere. It is the latter in which we are most interested. The ionosphere derives its name from the fact that it contains, instead of the stable gases of the lower atmosphere, a high proportion of electrically unneutral ions. These ions are created largely by ultraviolet radiation from the sun. In areas where gas molecules are few and far between, ionization will become quite high because there are relatively few positive ions with which the negative ions can recombine. Although this same phenomenon exists in the lower atmosphere, the air is so dense that gas molecules collide with each other at the rate of four billion collisions per molecule per second. Obviously, in such a dense atmosphere, an ion can have only a very short life - estimated to be only a few millionths of a second. Such a dense atmosphere tends to absorb rather than reflect radio waves, especially at lower frequencies. Table 1 - Relative conductivity of various types of terrain. But in the sparse regions of the ionosphere where there are relatively few gas molecules, the ions reattach themselves at fairly slow rates. In the upper regions of the ionosphere, called the F2 layer, recombination is so slow as to be relatively unimportant. The important thing about these ions is that they make the atmosphere electrically conductive. Thus the electromagnetic energy of a radio wave is partially transformed into kinetic energy represented by the motions of the ions. If these ions do not recombine, this energy is converted back to electromagnetic energy and the radio wave continues to be propagated. If, on the other hand, the ions recombine, absorption of the radio wave occurs and the wave is sharply attenuated. Now, one of the most important factors about this ionization is the fact that the greater the degree of ionization, the higher the frequency that will be refracted and returned to the surface of the earth. For any one frequency, there is a degree of ionization that is required to refract the wave sufficiently to return it to earth depending upon the angle of radiation. Frequencies higher than this, for the same angle, will not be sufficiently refracted and will not return to the earth. As far as the 27-mc. 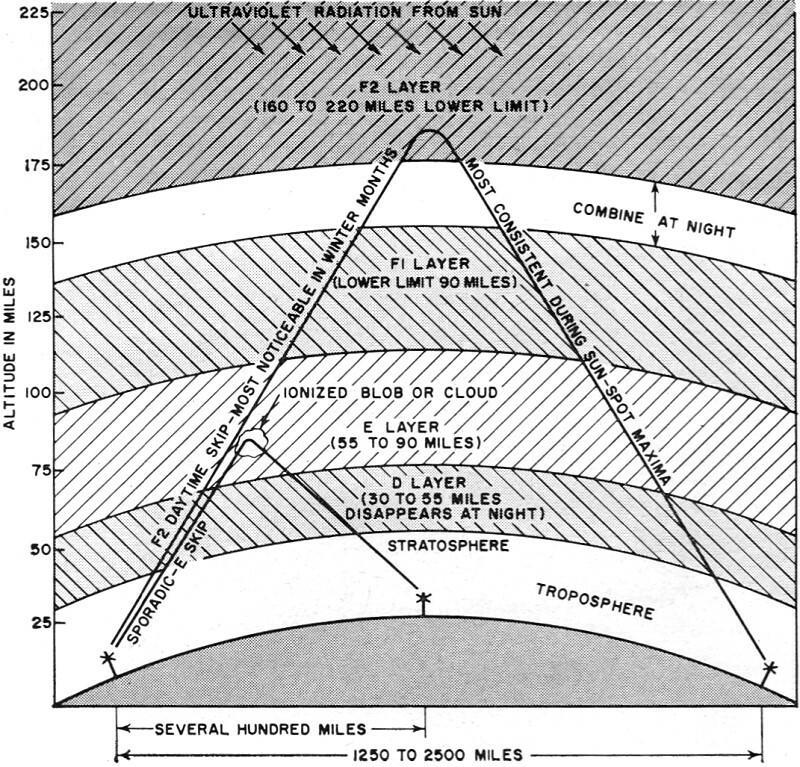 band is concerned, the required degree of ionization occurs in the F2 layer of the ionosphere which is the uppermost portion shown in Fig. 3. However, ionization alone does not tell the story. In addition to the factors of ionization and frequency, radio-wave propagation is also dependent upon the angle at which the wave strikes a particular layer of the ionosphere. At low angles of radiation, a lesser degree of ionization is required than at high angles. And, since most of our CB antennas are designed for low radiation angles, we can get reflections from the ionosphere when we could not if the angle of radiation from the antenna were considerably greater. Fig. 3 - Sky-wave CB signal propagation via the ionosphere. Ionization of the atmosphere is not a constant thing. It changes from day to day, hour to hour, season to season, and from one year to the next. It tends to be greatest during daylight hours, as in summer, and is further influenced by sunspot activities, magnetic storms, the magnetic field of the earth, the passage of meteors, and the presence of other types of radiation such as cosmic rays. Thus the ionosphere is undergoing changes in its ionization constantly. At night, for example, the lower or D layer practically disappears with the setting of the sun. Thus, broadcast-band waves are absorbed in the daytime but not at night, resulting in long-distance broadcast reception at night only. At night, the height of the E layer is lowered and the F1 and F2 layers combine into one layer somewhat closer to the earth than during the day. Peculiarly, although the D and E layers are less ionized in winter, the F2 layer is ionized more so and this effect is thought to be due to the magnetic field of the earth which seems to have a greater effect upon the F2 layer than the mere ionization of gas molecules by the ultraviolet rays of the sun. It is for this reason that we notice skip signals on 27 megacycles during the winter months and also because there is less attenuation of the signals in the lower regions of the atmosphere due to their reduced ionization during winter months. Since sunspot activities increase the ionization of the ionosphere, skip is more prevalent during the more intense period of the 11-year sunspot cycle. Now, let us see what happens when some winter month you are communicating with your mobile and your signals are heard 2000 miles away. As you transmit, part of your signal is radiated at a relatively low angle toward the ionosphere. When the signal enters the ionosphere it is entering an area of different density. At this point the wave is slowed down and starts to be refracted or bent by the difference in densities. The same effect can be noted optically when you thrust your arm into the waters of a lake. To your eye, it appears that your arm is bent where it enters the water. This is due to the different densities or different refractive indexes of air and water. As your radio wave continues into the ionosphere, it is bent more and more until it reaches a degree of ionization which is so high that it actually will reflect a 27-mc. signal. At this point the radio signal from your transmitter starts downward toward the earth, returning to the surface of the earth at the distant receiving station. The basic conditions of the ionosphere are reasonably predictable; so much so that it has enabled predictions with a fair degree of accuracy several months in advance of the propagation characteristics at various points around the earth. These are published by the National Bureau of Standards in the form of earth charts. By the use of these charts, you can determine, if you are interested, where you might be heard for any month of any given year. Up to now we've explained the minimum distance for F2 skip, but what about maximum distance. Greater distances than 2500 miles are due to multi-hop transmissions, that is, those which are reflected back to earth, bounced off the earth and back into the ionosphere, then returned to earth perhaps another 2500 miles away. This is a rare bird for CB, due to the fact that with only 1 to 3 1/2 watts output, the chances of multi-hop transmissions are not very good. If the signal bounces back to earth, the earth itself will usually absorb most of the energy so there is very little, if any, which can be bounced back into the ionosphere again. It does, however, happen occasionally, especially where the return to earth is at a place with good reflecting properties. Now that we've indicated that 1250 miles is about the minimum skip distance, you are apt to say, "OK, but what about the short skip signals I've received from only a few hundred miles away, or even less?" Shorter distance skips are due to the E layer, where the ionization becomes quite high, especially during the summer months or to so-called sporadic-E skip. This latter condition is one in which there are blobs or clouds of highly ionized gases in the E layer which may persist for a few minutes or a few hours. They occur quite often in early evening hours and may persist even after the sun has set, usually disappearing by midnight local time. These ionized clouds occur quite often, especially in summer, and can account for reception of signals from transmitters only a few hundred miles away from you. The characteristics we have discussed thus far account for most of the skip signals in the 27-mc. band. There are some unusual conditions which can account for the sudden appearance of signals from almost any distance up to several hundred miles or even farther. These include such effects as meteor showers, tropospheric scatter, ionospheric scatter, back scatter, reflections from satellites, and other causes-all of which are relatively minor but which may account for some of the bizarre results we sometimes get. The first thing, of course, is not to answer skip signals, even though some eager beaver calls your number from 2000 miles away. But, other than ignoring them, there is little you can do about the interference they might cause. Skip signals have one characteristic which antenna manufacturers may use some day to reduce the reception of CB skip. Although your signal is vertically polarized when it is transmitted, the polarization becomes circular or elliptical when it is refracted by the ionosphere. Such a signal has both horizontal and vertical polarization. Now, if some antenna manufacturer can come up with a device which reduces or cancels out the horizontal component of a skip signal, he might be able to attenuate such signals and so reduce interference. 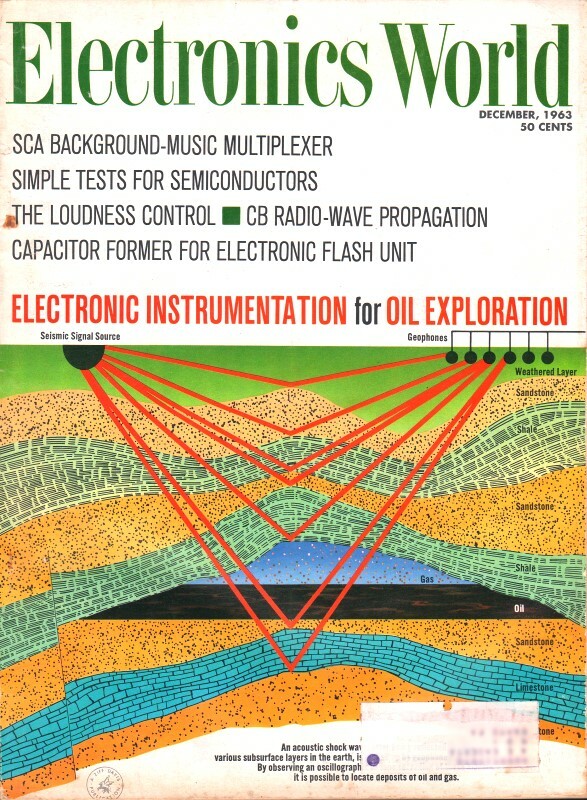 The propagation of radio signals can be an intensely interesting subject. Much is known about it, and more is being learned as we advance into the space age with space probes capable of entering or going through the ionosphere.